Once again I saved track until Tuesday as it seems Rob and I do better doing track sessions on our own. I run faster than I would in my group on Monday and Rob wouldn’t even be in my group yet he is capable of sticking with me (actually quicker than me as he runs in lane two) with ease in these sessions. Anyway this week he had chosen a 5k specific session that comprised 5 laps at 2 minutes a lap all the way down to 1 lap taking 10s off per lap each time the laps drop by one (why are these sessions so difficult to describe on paper?). The first set of 5 laps was hard as it needed to be very slow. However it was useful that it broke up easily into 30s per 100m. In fact I had spent the whole night worrying and calculating the 100m pace for each section so I knew what we were needing to hit on each 100 on each rep but I couldn’t then do the maths past a couple of hundred metres. Luckily Rob did that so between us we managed to pace them pretty well. Rob was still raring to go at the end so he went off to do some sprints whilst I did not. I need to cycle to the track NOT the way I did this morning. A good session and something completely different to the usual things we do. In the evening I went to Tom’s session as it was 2 x 5k so it was perfect to run at a solid but steady pace. I ran with Kev so I knew the pacing would be sensible and consistent. 22.16 and 22.28. On Wednesday it was a simple matter of the usual LSR. 10 easy miles. Thursday evening was going to be a hard one. 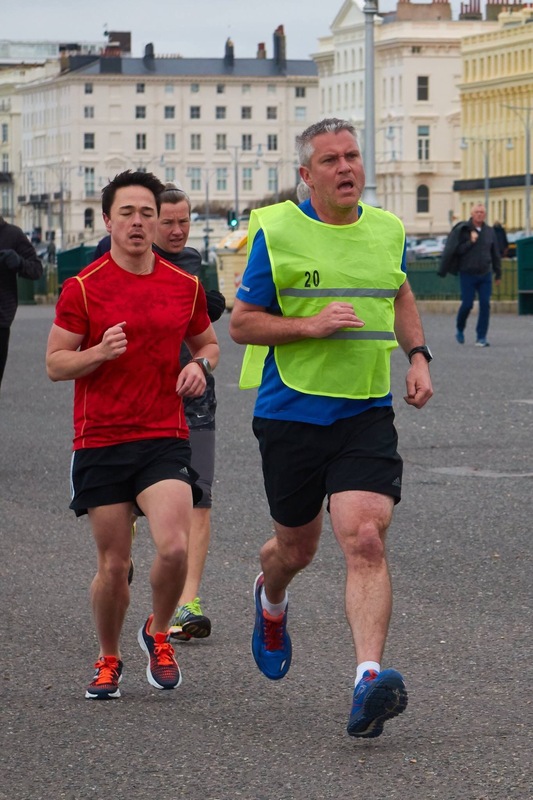 5 x 1k on the prom with Tom’s group. Eeek! I wanted to see if I could get back to the days of 3.45s for these. Though it may only have been a single day. The weather was good. Not too windy or cold. My plan was to try and stick with Tom so the reps were sensibly paced. The cone was back (flashing) and the turn point was round a beach shelter. It was a bit stony in places and the shelter 180 degree turn slowed me down a bit (getting the excuses in). However: 3.54, 3.52, 3.52, 3.53, 3.53 off two minutes recovery. Hootsy! I was pleased. Ok so not quite 3.45 but it’s still cold and I always do better once it’s a bit warmer. 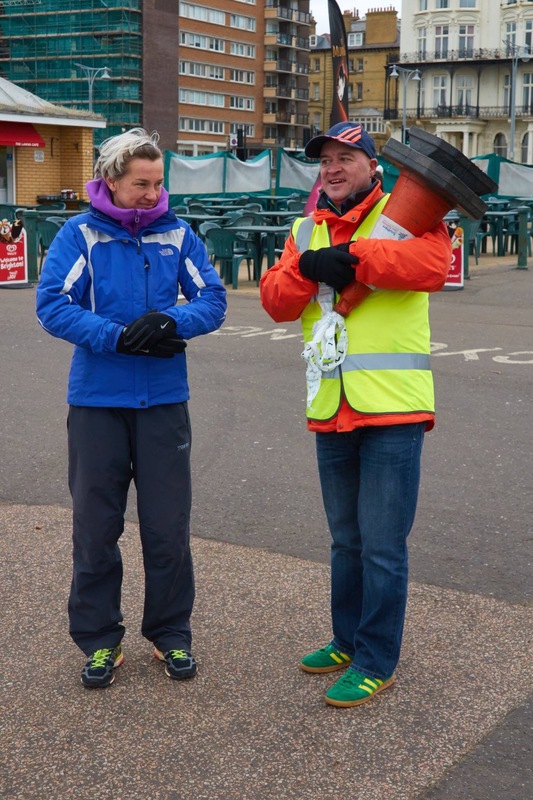 Mark told me the prom parkrun weather would be good because he was Run Director so I decided to go there on Saturday (I would have anyway but it’s always better when there is no hurricane). There was a 20 pacer so I knew I’d have to try and go with him. I passed half way dead on 10 minutes but lost touch with the 20 pacer from there and then slowed further as the wind picked up considerably in the last long stretch to the Peace Statue. I did manage to pick it up in the last 500 wind behind to the finish but alas it was still well over 20 minutes. 20.23 in fact. 1 second slower than last week. Good consistency though and basically a replay of the last time. Anyway it was acceptable and cindistent with last week so hopefully I can at least stay here for the coming weeks then carve a big chunk off when the day is right. Today (Sunday) I dragged the long suffering Rob out so I would do a long run. 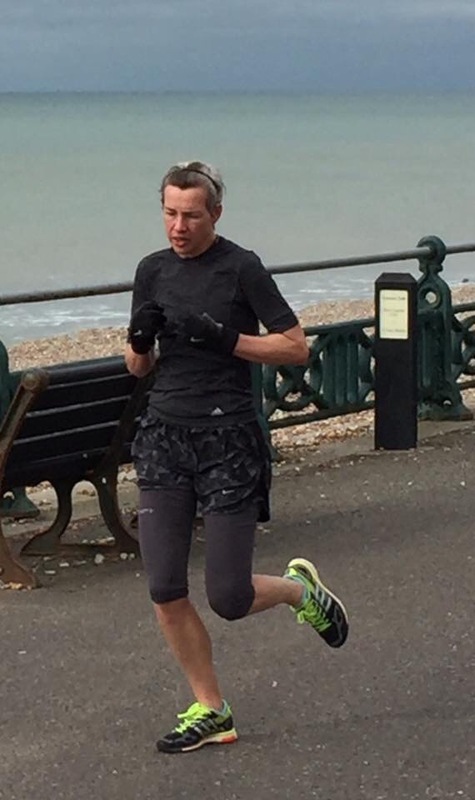 Speaking of Rob, props for the parkrun pb!!!!!!!!! (Holdaway style commemoration!!!!!!). The run was fine. 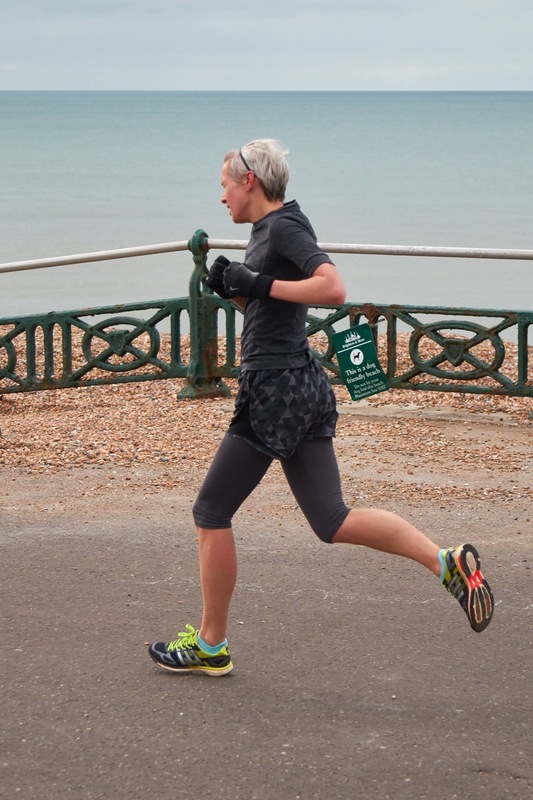 It’s amazing (but not of course, just sense) what eating enough does for a long run. No death in the final miles. An unexpected 38 miles for the week.